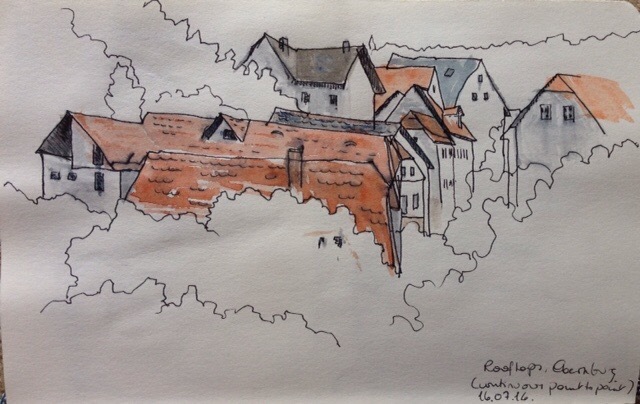 I have just spent two weeks in Bad Münster am Stein beside the Nahe river in Rheinland Pfalz. This was my first trip to the region but definitely not the last. Bad Münster has been a spa resort for just over a century and has mostly grown up since then as a modern but still small town with relatively few older buildings. However, its character stems from its setting in a narrow gorge between dramatic and beautiful sandstone rocks, which limit the town’s size. Most recent development has occurred in Ebernburg, the town that lies just across the river. The Nahe is at its wildest here with a series of bends providing a range of vistas, small weirs and rapids, interpersed with calmer sections of water. Herons and cormorants fish here and electric blue and turquoise dragonflies flit through the orchids that grow wild on the river banks. The high rocks gradually become rolling hills in the surrounding area, on which lie vineyards. The Nahe valley is a major producer of white wine, especially Riesling, in Germany. My drawings focused mainly on the many wonderful old ruins to be found in the area. 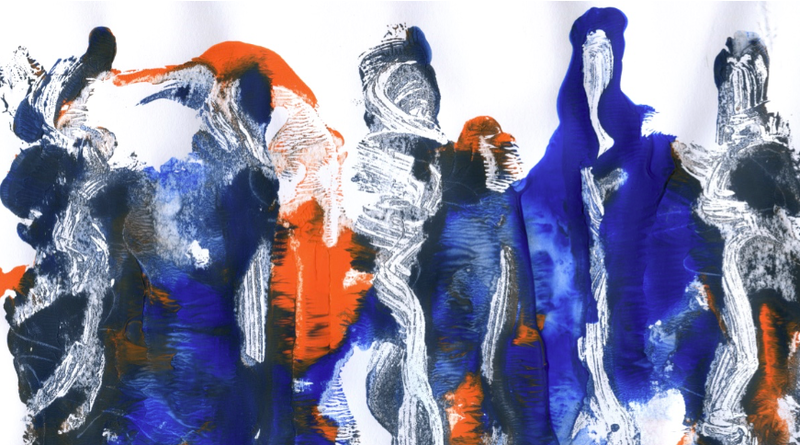 They were drawn with a fineliner and coloured using stubs of Derwent’s Aquatone watercolour sticks. This has been my go-to travel watercolour set for some time and is a really lightweight and compact paint set (it fits in a piece of polystyrene in a cough sweet tin) but I intend to switch to half-pans in order to change my colour range and make it easier to lather up the paint. Burg Rheingrafenstein lies above the Nahe above the town of Bad Münster am Stein. It can be reached by taking a ferry and then walking up a fairly steep path through forest. The path becomes a winding set of steps – hard work but worth it for the glorious view from the top. 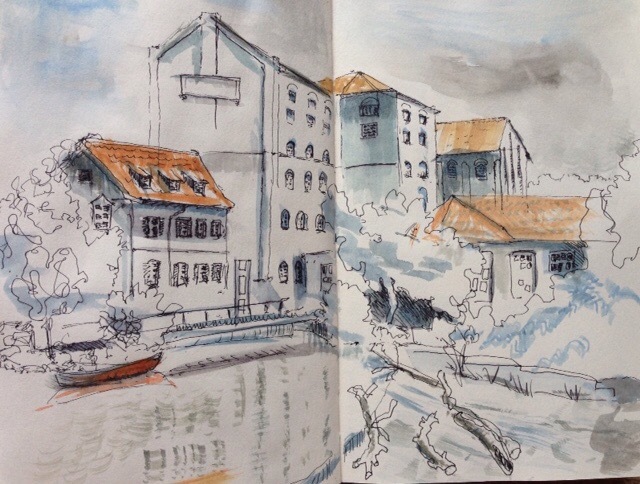 This drawing was made looking up from across the river, while a cormorant fished nearby. There is also a very good icecream kiosk just there. From the balcony of my apartment, I could see the rocks further along the river. The highest point is called the Bastei (ancient artillery fortification) and it is possible to walk along quite a long section of the cliffs, with marvellous views of the two towns and river below and the hills way beyond. 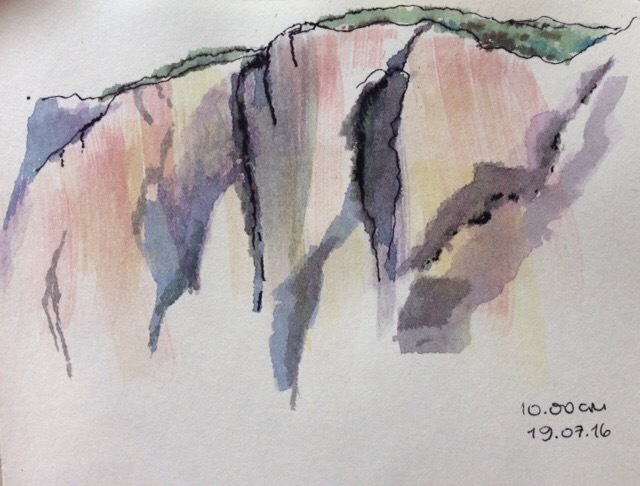 I drew the rock face at different times of day. 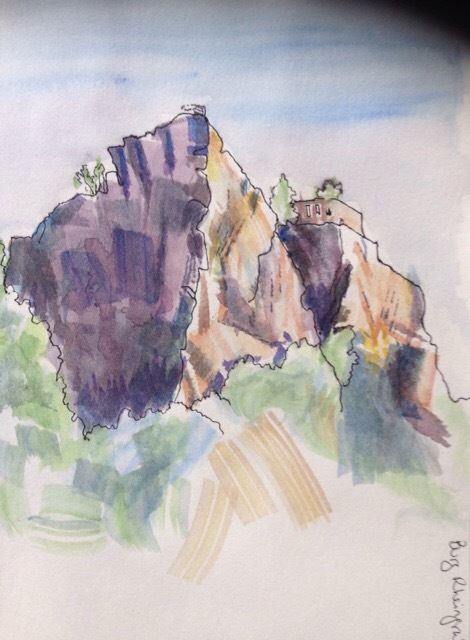 This one drawn mid-morning had the best value contrasts and best represents the magnitude and drama of the rocks. This is a view from the balcony in the other direction. Apart from the road and rail bridge, a second pedestrian bridge includes a sheltered seating area (the odd “mushroom” in the drawing) from where one of the wilder sections of the river can be admired. 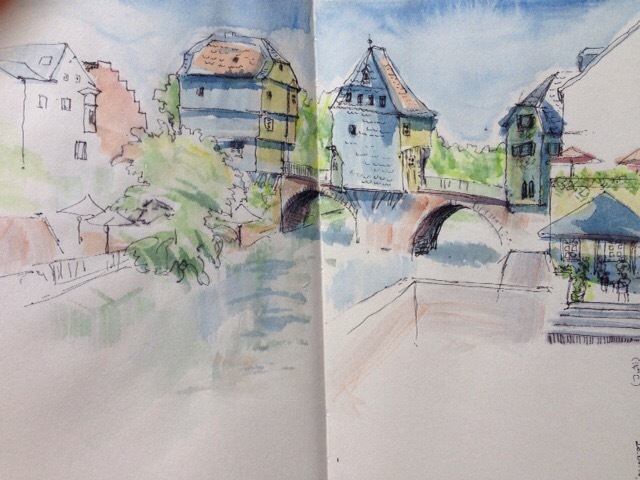 At this point, a second river, the Alsenz, enters the Nahe. On warm days, it is a lovely spot to sit and enjoy the view and a cool breeze. An information board explains that JMW Turner painted here. Here is a first and second link to Turner’s paintings of this area, both of which are in the Tate Gallery in London. I feel slightly embarrassed placing my own work alongside Turner’s …..
One day, I began a walk from a village called Odernheim-am-Glan. The Glan river is another tributary of the Nahe. 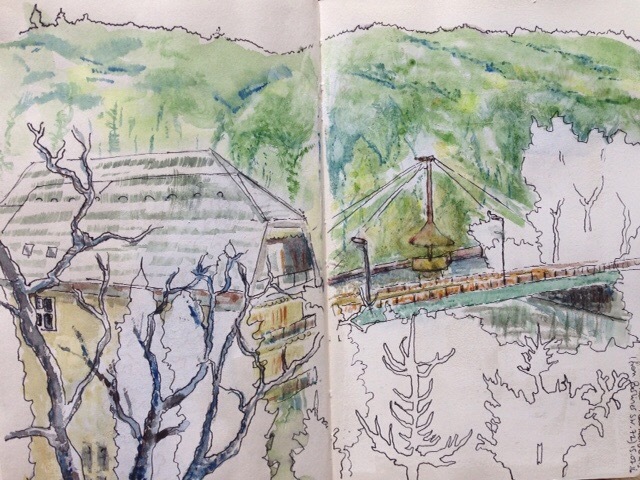 As I got off the bus, I saw this wonderful old mill beside a weir and sat down to draw it. In the centre of the neighbouring spa town of Bad Kreuznach is this splendid old bridge, complete with a house in the middle of it! The bridge is currently being renovated – the entire structure beneath the house must be renewed bit by bit!